March 1929 on the stage of Volksbühne Berlin: Wearing a metal mask, a silvery shining suit and metal balls at her hands, the dancer Karla Grosch moved between two bent, polished metal plates. However, she did not dance in this “Dance in Metal”. She rather modelled reflections, light and shadow effects. The “Bauhaus Dances” were experimental arrangements. In the Bauhaus stage workshop, the students should not become theatre makers, actors or dancers but strengthen their sensibility in the handling of material and space by motion exercises. Contemporary physical exercises for designers are shown in the Festival Stage Total. The Bauhäusler claimed to think theatre “in total” to translate the speed and complexity of modern life in new innovative stage events. The boundaries between audience and actors should be dissolved, and new design media incorporated, e.g. light, film and mechanical appliances. One hundred years after the foundation of the Bauhaus, the Festival Stage Total invites to Dessau for 100 hours to jointly plunge in the experimental arrangement Bauhaus Stage. International performers, choreographs and artists, but also architects and designers, make suggestions by installations and stagings and in performances and workshops. The visitors decide themselves which role, which distance, which depth of experience they want to obtain: By their autonomous movements through time and space, they directly define their own course of the festival. 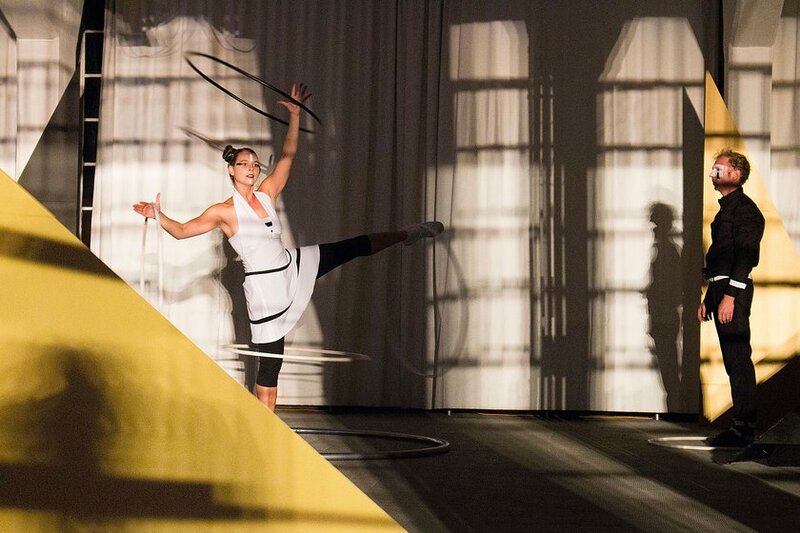 In addition to the Open Stage in the foyer of the Bauhaus Museum, showing performances throughout the complete 100 hours, each of the festival venues emphasizes its specific features. In the Bauhaus Building, in the Masters‘ Houses and in the Anhaltisches Theater, the visitors will experience a festival of motion, space and experiments with pinnacle formats, great performances and many amusements. Without stop, the motion space of artists and audience is continuously expanding during the 100 hours. In Nacht@Bauhaus, local surprise guests will perform between the days of the festival, accompanying the overnight guests in the sleep lab in the Bauhaus while falling asleep – or keeping them awake – by music, readings, performances as well as light and audio installations. Bauhaus Building: Finales come-together; Anhaltisches Theater: second performance of Wassily Kandinsky's color opera "Violett" in a production by Arila Siegert; Master's Houses: Nico and the Navigators, "Der Verrat der Bilder"